Stand up for sexual and reproductive health and rights; family planning and safe, legal abortion. The Global Day of Action for Access to Safe and Legal Abortion is on 28 September. As part of this year’s campaign, ICMA have joined forces with Ipas and International Planned Parenthood Federation – Western Hemisphere Region (IPPF/WHR) with a petition calling on Samantha Power, the US Ambassador to the United Nations, to urge world leaders to affirm sexual and reproductive rights – including the right to safe, legal abortion – in the post-2015 development agenda. We believe in a world where every woman has the right to make decisions about her body, her health, and her future. Yet this vision is far from reality. In much of the world, women still don’t receive the sexual and reproductive health care they want and need. And the consequences are dire. This month, global leaders will meet at the United Nations in New York City to make long-lasting decisions that affect every woman in the world. That’s why we’re joining forces to demand that all governments fulfill their obligations to women. Nearly 60 countries have stood up for sexual and reproductive health and rights, like family planning and safe, legal abortion. And as a key global partner, US leadership is needed to ensure that these rights are prioritised in the UN’s post-2015 agenda, particularly in the areas of health, gender equality, poverty eradication, and education. Join us in calling on the US Ambassador to the United Nations to encourage all world leaders to support a woman’s right to make her own decisions about her own body. I’m calling on you to be a leading advocate for women’s sexual and reproductive health and rights at the United Nations General Assembly. 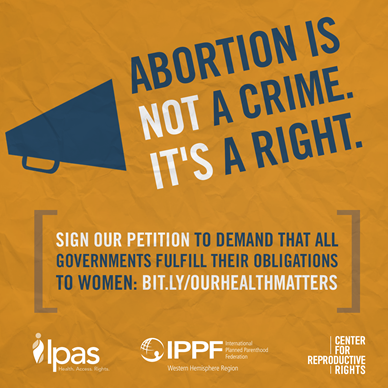 The post-2015 agenda must affirm a woman’s right to make her own decisions about her body, her health, and her future. Despite signs of progress – like a 50 per cent reduction in maternal deaths in the last 20 years – more attention is needed by governments to fulfill their obligations to women. In the last two decades, a million women and girls have died and more than 100 million have suffered injuries due to complications from unsafe abortions. And today, at least 200 million women worldwide want, but cannot access, contraception. I urge you to be a leader in ensuring that women’s sexual and reproductive health and rights – including family planning and safe, legal abortion – are not just present but prioritized in the post-2015 agenda, particularly in the areas of health, gender equality, poverty eradication, and education. Please join us: please sign our petition.